LSD Museum or Institute of Illegal Images? Mark McCloud revels in psychedelic visuals inside his Mission home, which he dubbs the “Institute of Illegal Images,” a reference to his archive of LSD-inspired art. Seated around an ash-stained coffee table below a glowing chandelier in Mark McCloud’s dusky parlor on a rainy Saturday morning in October, four friends passed around a joint, trying to define in simple terms the three-story Victorian on 20th Street. “It’s an archival museum of psychedelic art. Our friend here is the curator,” proffered Arthur Round, an older man cross-legged in a wicker chair. The parlor is plastered with approximately 350 pieces of framed blotter art and guarded from prying eyes by heavy black curtains, making the space feel like a vault or secret subterranean headquarters. Until Nov. 25, dozens of the pieces, as well as some digitally enhanced reprints, are on display at Ever Gold Gallery in the Tenderloin. McCloud’s mission is to preserve a “skeletal” remnant of San Francisco’s drug-induced 1960s legacy, “so maybe our children can better understand us,” he said. 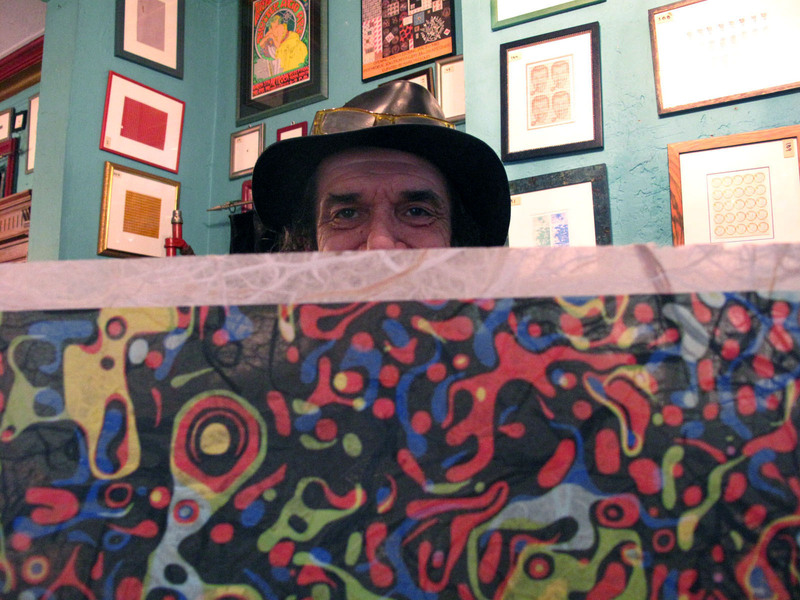 Collectors in the business consider him the bearer of the world’s largest cache of psychedelic blotter art and its foremost historic authority – an institution unto himself. McCloud said he’s intent on protecting the meaning of acid rooted in the user’s experience – largely to counterbalance the stigmatization of the drug by government officials. 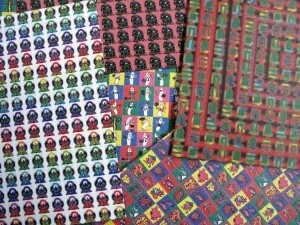 Blotter paper emblazoned with colorful cartoon visuals and perforated into hundreds of break-away tabs is scattered around McCloud's Mission home. The problem, he’s decided, is that bureaucrats haven’t tried the trip. Billed “Tranquilizers for a Drug Enforcement Agency gone rogue,” McCloud’s current exhibition is a proud middle finger at the federales whose promise of life behind bars he escaped – twice. In 1992 and again in 2001, agents arrested McCloud on charges of conspiring to distribute LSD. The breadth of his collection spawned suspicions that he was a drug kingpin. In the latter case, federal agents descended on his Mission home and seized several hundred framed sheets from McCloud’s living room, only to find some had never been spiked with acid. Others that may have been had since been chemically neutralized. Juries in Texas and Missouri – where drug busts turned up blotter that agents linked to McCloud – acquitted him both times. The indexed evidence from the trial decorates McCloud’s parlor, and some of it was selected for the show at Ever Gold. The DEA marked each confiscated piece with masking tape and a number. Some of the sheets, the ones measuring 8.5 by 11 inches, contain 1,000 tabs or more. In the 60s, conventional wisdom denoted the bar for achieving clinical insanity at 200 hits of LSD, according to McCloud and Rounds. Ask them how many they’ve taken in about 40 years and they’ll tell you less than that amount. In the same moralistic manner many San Franciscans pontificate on the health benefits of marijuana, McCloud and his friends tout the merits of acid. What else will it cure? Anxiety, depression and “marital problems,” Rounds said. Gregory Ito (foreground), co-director of Ever Gold Gallery in the Tenderloin, helps McCloud (back) select pieces for his three-week exhibition. It’s been good to McCloud for a long time. 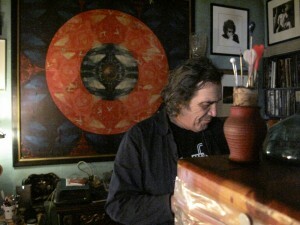 Born and raised in Argentina, McCloud began experimenting with psychedelics during adolescence while attending Webb School for Gentlemen, a boarding school in Claremont, Calif.
McCloud switched focus from medicine to art, and after college studied Renaissance art in Paris before settling in San Francisco. He put a down payment on his Mission home in 1983 using money from a National Endowment for the Arts grant. He served as vice chairman of the Artist Board at San Francisco Art Institute from 1977 until 1987, the year of his first blotter art show. McCloud got serious about collecting blotter in the early 1980s, and started framing and hanging the works instead of sticking them in the cold, dark freezer, where they were likely to get eaten on impulse. “I realized, ‘This is a good way to save them,’ ’cause you can’t swallow the frames,” he said. By stockpiling the sheets, McCloud is essentially positioning himself as a force the mainstream art community will have to acknowledge one day, Cushway said. The bulk of the collection remains tucked away, out of reach from harmful ultraviolet light and the government. A 1960s print by graffiti artist Såtty called "All-Seeing Eye of Agamotto" adorns McCloud's home study. I enjoyed this article very much. LSD for anxiety & depression…interesting. 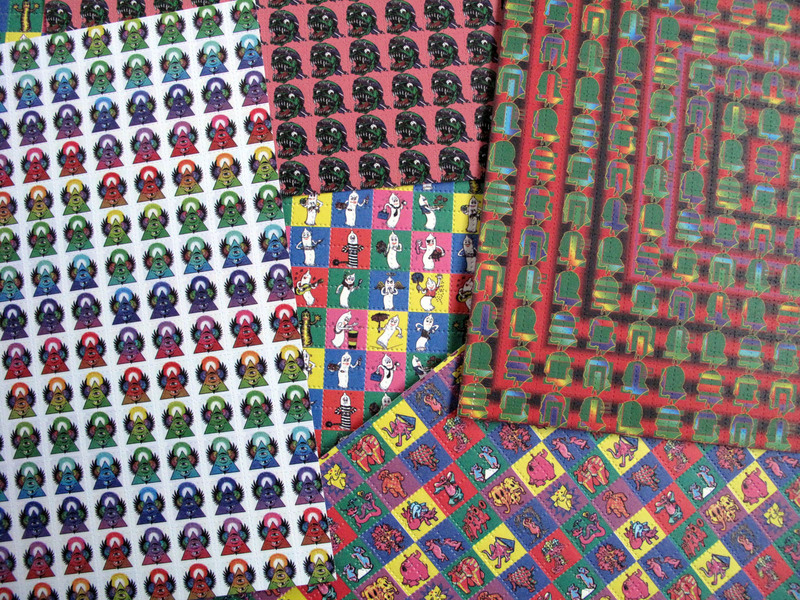 The popularity of blotter art collecting has grown enormously over the last 10 years. More and more homes are hanging the artwork on their walls where it belongs. Not in the police vaults or museum. The police are not so good at collecting LSD to beat Mark’s collection that’s why they want him, so they can get his great collection of artwork. Well done Mark, a great man and a great collection. Hands off Pigs. 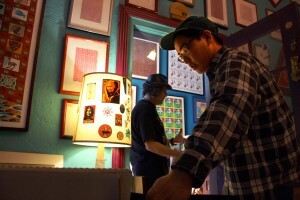 Great article…I had the luck of attending a great blotter art show at The Museum Of Deat in San Diego Ca. back in the early – mid 90’s…Some incredible art that expressed the cosmic joke wonderfully.Keep it it up. Be more respectful of you what you people write, The Satty does not “adorn”, and that is NOT a picture. Be more aware of WESTERN ART before you write . Do not confuse French cuisine withe a $1.99 chinese food. Getting a bit precious, are we?